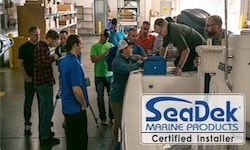 Rockledge, FL (March 10, 2017) - To meet growing demand both domestically and abroad, SeaDek Marine Products, the leading manufacturer of EVA non-skid products for the marine industry, is pleased to announce the addition of 10 new Certified Installers to their growing network. These new SeaDek professionals will bolster representation in the US with locations in Colorado, Washington, Michigan, California, New York, and Florida, as well as globally with new Certified Installers in Ontario, Canada, and the United Kingdom. During factory training at SeaDek's world headquarters in Rockledge, Florida, candidates for certification get in-depth hands-on instruction on SeaDek's digital patterning processes, CAD design, and advanced installation techniques, preparing them for the most demanding SeaDek applications in the field. While SeaDek brought customized EVA non-skid flooring to the marine industry over a decade ago, there are inferior knock-off products entering the market, and it is crucial that boaters request genuine SeaDek and use the services of a SeaDek Certified Fabricator or Installer to receive the highest quality products and service. With the addition of these new Certified Installers, fully custom SeaDek installations are within reach of more boaters than ever. A complete listing of SeaDek Certified Fabricators and Installers can be found at http://www.seadek.com/customseadek.asp. SeaDek manufactures a wide range of EVA non-skid products for OEM boat builders, aftermarket customers, and dealers. In addition to custom products, SeaDek offers an extensive line of retail items, including DIY sheet material, anti-fatigue helm station pads, coaming bolsters, and more. As a safe and comfortable alternative to molded-in non-skid, paint-on textures, and other marine traction products currently available, SeaDek provides exceptional traction and aesthetically pleasing stylistic options. Made in the USA from UV protected non-absorbent EVA foam, SeaDek utilizes an acrylic-based 3M™ pressure sensitive adhesive for a lasting bond and simple peel-and-stick application. In 2014, SeaDek became an employee owned company with the implementation of an ESOP profit sharing plan. With a wide array of colors, textures, and thicknesses available, there is a place for SeaDek on every boat. Learn more at http://www.seadek.com.